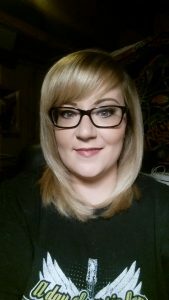 Jennifer Powell graduated January 2015 from our Cosmetology program in Manhattan, Kansas. This is her story. When I was 28 and a single mother of a 2-year-old son, I got a terrible phone call that my brother had commuted suicide. It was life shattering and really had me thinking about the direction my life was going. I was working a dead end job trying to support myself and my son. Cosmetology had always been something I was interested in, but living in a small town, there was no way to really make a living at it. The cosmetology schools near me had terrible reputations. On the day of my brothers funeral, I was talking with one of my brothers, whom I hadn’t seen or talked to in many years. He was currently attending Bellus Academy in the Massage Therapy program and had nothing but great things to say about the school. He saw my eyes light up when he mentioned cosmetology school. He then offered for my son and I to come live with him so I could go to school. I thought it out for a few months and even visited Bellus. I finally made the decision to go for it. I sold and gave away practically everything I owned and my son and I moved to Manhattan, KS with my brother. It was both terrifying and exciting at the same time. Upon starting school, I quickly realized that it was going to be much more difficult than I had imagined, but I was up for the challenge. I poured everything I had into learning as much as I could. I knew that the experience would be what I made of it. I was taking the night program and received so much support from my instructors. The curriculum was very thorough and I had fun learning. The projects we did in the classroom taught me so much. I was taught everything I needed to succeed from the basic theories of color and cutting to how to be a professional in the industry. I was also given the proper training to be able to easily pass my written and practical tests to become licensed. Upon graduating and receiving my license, I moved away to the Kansas City area and was able to get a job right away. Three years later, I currently booth rent for Salon Hello Beautiful in Western Shawnee, Kansas and have a fantastic clientele! I am still building my clientele and have a long ways to go, but this has been such a fulfilling career so far. I do believe this is what I was put on this earth for and so thankful I found Bellus Academy to get me on my way!